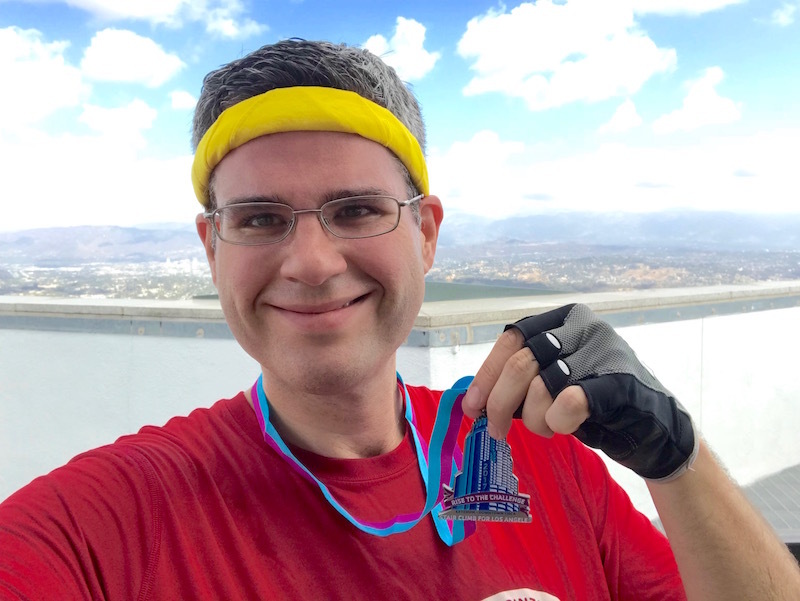 My Fifth Race Up the Tallest Stairwell in the West! 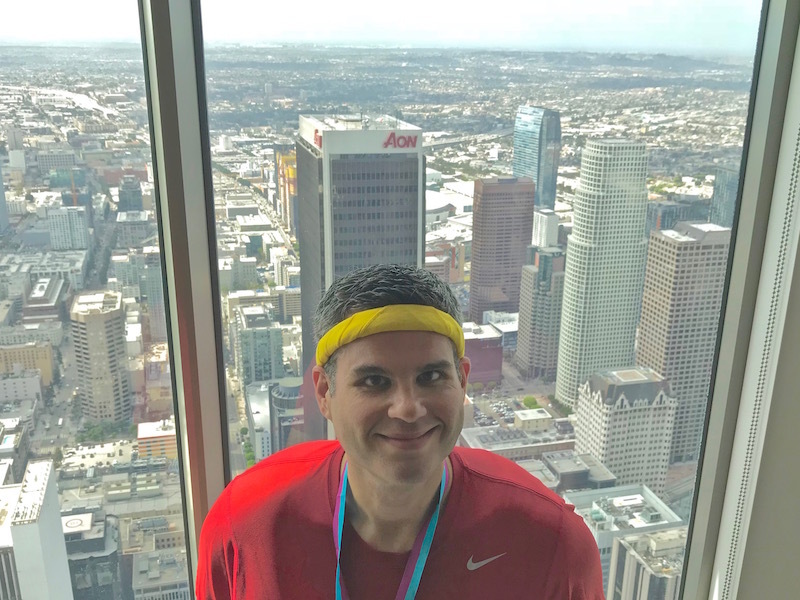 (Stair Climb for Los Angeles Race Recap) | Keep It Up, David! But also, I learned a valuable lesson at this race last year, and I was focusing on that. I was fresh off a foot injury last year, and I competed with no expectations whatsoever, and ended up getting my second-best time. So this year, I tried to take the pressure off myself, and go into it with a have-fun attitude, because that worked so well last year. It turned out to be easy to take the pressure off, because my morning was busy, and things were happening quickly. First off, this is a very popular race, so lots of friends came in from all over the country, and it was great to see folks and catch up. 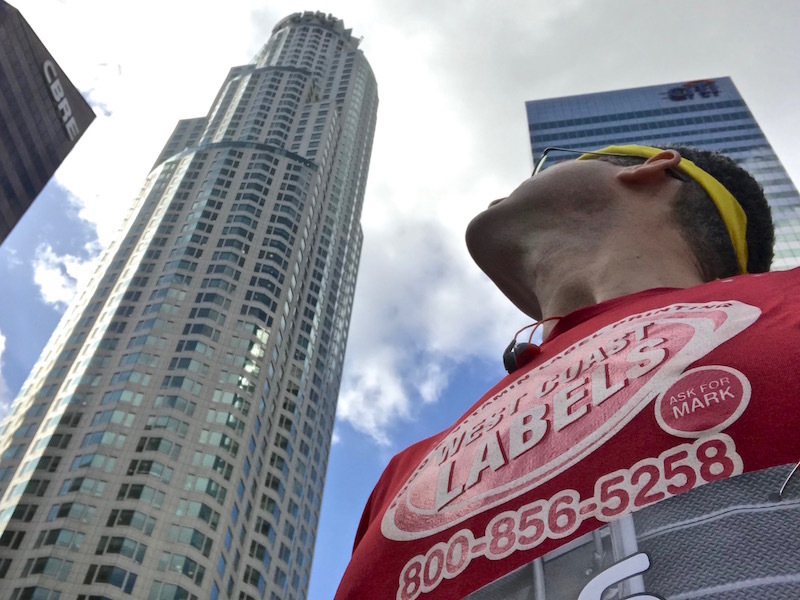 Plus, they didn’t open the bib pick-up table until 30 minutes before the race, so then it was a bit of a scramble to put the bib on, do a little warm up, stretch, and get to the starting line, which was two blocks away. I was racing in the very first wave – the elite group, comprised of all the fastest racers. (I’m certainly not one of the fastest, but I qualified for elite anyway.) We all queued up outside the building, and with very little fanfare or even notice, people started entering the building. Within seconds it was my turn, and while I was excited to start, I also felt a touch unprepared, mentally. Those thoughts disappeared in the stairwell, because climbing stairs is hard work. There was a bit of traffic jam about five stories up, and I climbed along the outside rail and let everyone pass, and then let them jockey amongst themselves for position. After that it was pretty smooth sailing, climb-wise. 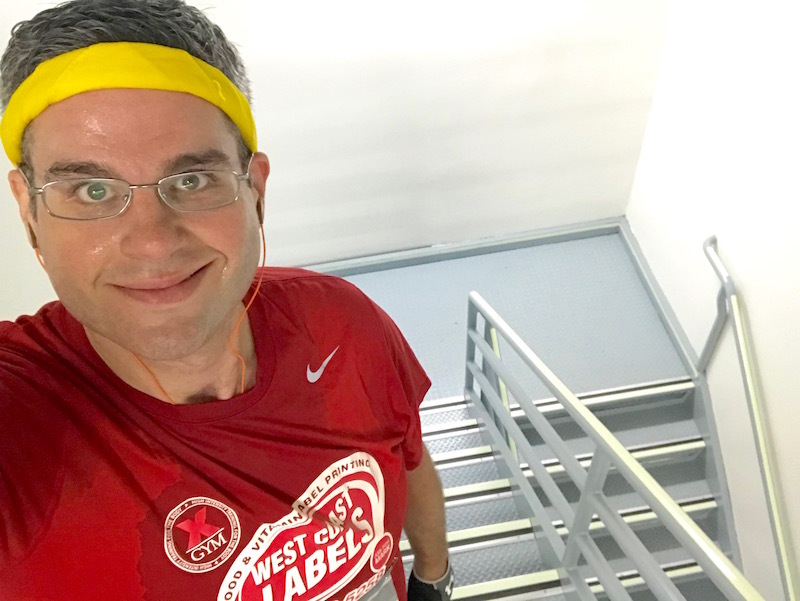 I tried to pace myself and start slow, and I did a pretty good job at that, even though every time someone passed me, I felt the urge to pick up the pace and stay right behind them. All that stuff is pretty minor, though, when you’re dealing with tired, heavy legs, a pounding heart, and lungs that are struggling to pull in enough oxygen. I’m familiar with those feelings, and even though it’s challenging to deal with, there was a part of me that enjoyed feeling it. It’s familiar, like a warm blanket. A warm, sweaty, excruciating, debilitating blanket. I took this selfie on a subsequent climb, but that is the race stairwell! My goal for the final five stories of any race is to try my damndest to sprint to the finish, but during this race it was hard, because I was already so wiped out. But I stumbled across the finish line on the roof and found a wall to collapse against. I felt good, in an awfully-tired-and-in-pain sort of way. I knew I done my best, and that I couldn’t have gone faster. I didn’t time myself, but I knew, based on the number of songs that had played on my iPod, that I was in the vicinity of a personal best. It would take a little time before times were available, so I enjoyed the view. 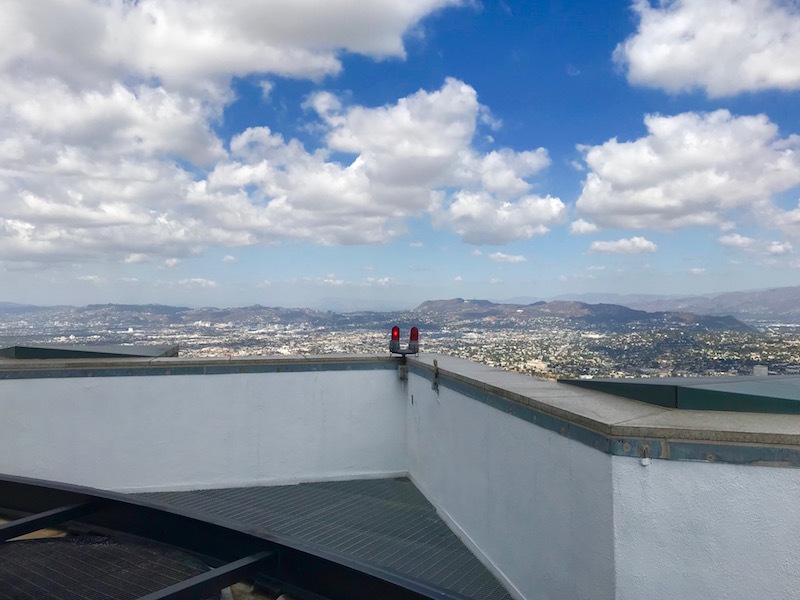 The view is incredible! You can’t get higher in Los Angeles without being in a plane or helicopter. And of all the Finisher’s Medals I’ve earned at this race, this one is by far my favorite. 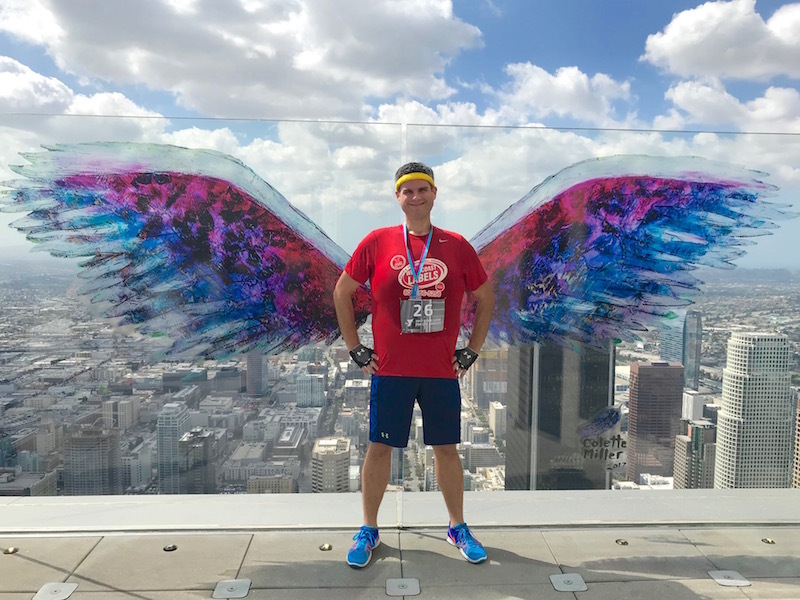 The observation decks on the 69th and 70th floor provided even more awesome views, including a great view of the Aon Center roof – a roof I’ve raced to 6 times. My time this year? 18:34! Only four seconds off my PR! Wheeeeee! I was very excited about that – very excited indeed! My day wasn’t over. I ended up climbing the US Bank Tower two more times – once by myself, and once with Cal and his entourage. Cal is the friend I met a few weeks back, who has gone from comatose after a devastating accident, to re-learning how to talk and walk, and has now raced up a 75-story stairwell. He’s incredible. That’s 225 stories climbed in one afternoon. An awesome way to start the weekend! A big thanks to my parents, who joined me in donating to the Downtown-Ketchum YMCA so that I could participate in this race. Thank you for the donation and support, mom and dad! This entry was posted on Tuesday, September 26th, 2017 at 11:55 pm and is filed under Uncategorized. You can follow any responses to this entry through the RSS 2.0 feed. You can leave a response, or trackback from your own site.